Hello. What's got three isotopes, keeps swimming pools clean, damages the ozone layer and is used in more chemical synthesis reactions than you can shake a benzene ring at. Well the man with the answer is Tim Harrison. 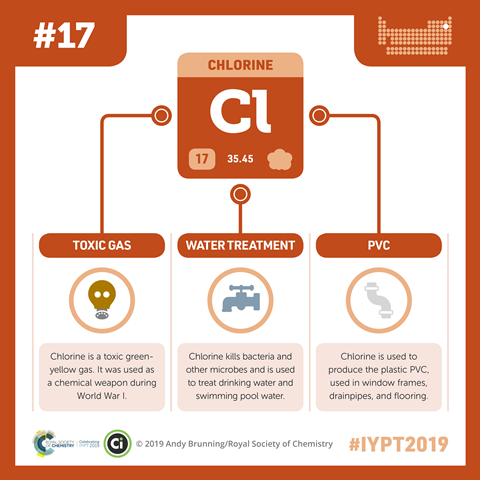 Chlorine is what you might describe as a Jekyll and Hyde element; it is the friend of the synthetic chemist and has found a use in a number of 'nice' applications such as the disinfecting of drinking water and keeping our swimming pools clean. It also has an unpleasant side, being the first chemical warfare agent and taking some of the blame in the depletion of the Earth's ozone layer. 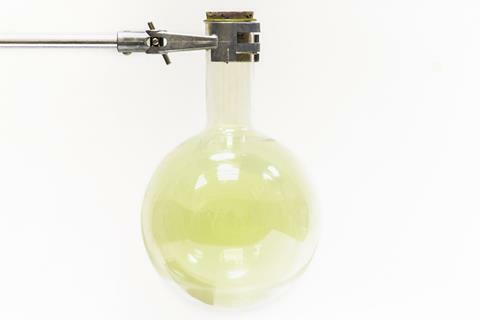 Elemental chlorine is a pale, yellowy green gas at room temperature. It was the Greek word khlōros meaning 'yellowish-green' that was used as inspiration by Sir Humphrey Davy when he named this element in the 19th century. 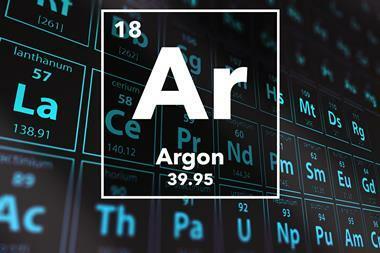 This element was first isolated in 1774 by the Swiss-German chemist Carl Wilhelm Scheele, by reacting hydrochloric acid with manganese (IV) oxide. But he failed to realise his achievement, mistakenly believing it also contained oxygen. It was Davy in 1810 who finally concluded that Scheele had made elemental chlorine. 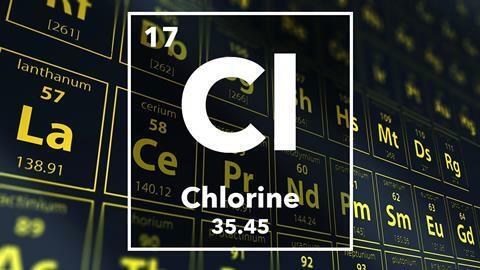 Chlorine is in group 17 of periodic table, also called the halogens, and is not found as the element in nature – only as a compound. The most common of these being salt, or sodium chloride, and the potassium compounds sylvite (or potassium chloride) and carnallite (potassium magnesium chloride hexahydrate). It is also estimated that there are around two thousand organic chlorine compounds. 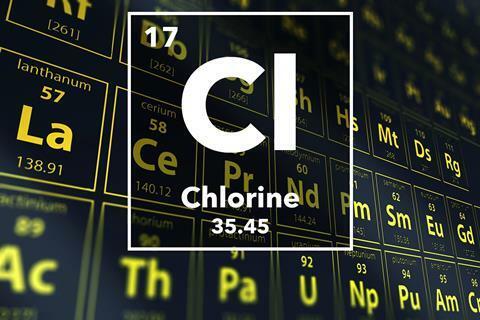 Chlorine has two stable isotopes chlorine-35 and chlorine-37 with chlorine-35 accounting for roughly 3 out of every 4 naturally occurring chlorine atoms. Chlorine-36 is also known naturally and is a radioactive isotope with a half life of about 30,000 years. Chlorine has a major role to play in synthetic organic chemistry, taking part in three of the most common reaction mechanisms. In the first of these, the photochemical substitution reaction, chlorine reacts with an alkane by replacing one of the hydrogen atoms attached to a carbon forming a chloroalkane. This radical reaction is initiated by the use of sunlight or ultraviolet light to split diatomic chlorine into two radicals. Chlorine can also react with alkenes via the electrophilic addition mechanism. This time two chlorine atoms add to a molecule across the electron-rich carbon-carbon double bond. This reaction has to be carried out in the dark to avoid complications with competing free radical substitutions. A third common mechanism is electrophilic substitution, which occurs when chlorine reacts with a benzene ring by replacing a hydrogen atom forming chlorobenzene and hydrogen chloride. This reaction is most commonly known as the Friedal-Crafts reaction. Chlorine also has a multitude of industrial uses. Including making bulk materials like bleached paper products, plastics such as PVC and the solvents tetrachloromethane, chloroform and dichloromethane. It is also used to make dyes, textiles, medicines, antiseptics, insecticides and paints. It's best known uses however are probably in making bleaches such as 'Domestos' and in treating drinking and swimming pool waters to make them safe to use and of course its role as a chemical warfare agent. The treatment of water with chlorine began in London after a cholera outbreak in 1850 when the physician and pioneering hygienist John Snow identified a well in Soho as the source of the outbreak. Chlorine is still used in most sewage treatment works today. Snow also used a compound of chlorine – chloroform with the formula CHCl3 – as an anesthetic to aid the childbirth of two of Queen Victoria's children. 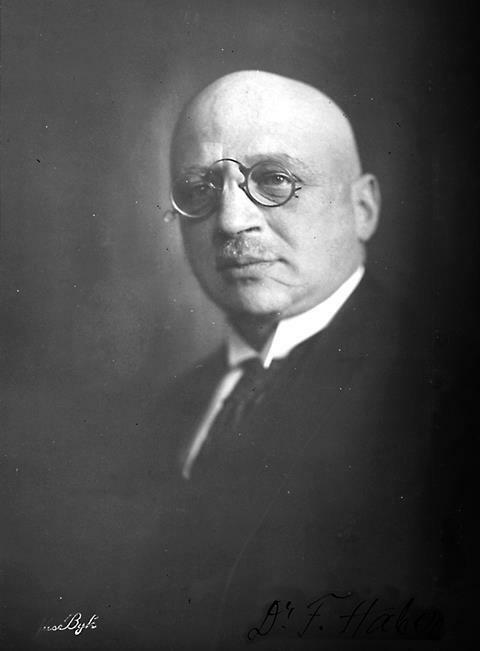 The use of chlorine gas as a chemical weapon was pioneered by German chemist Fritz Haber, who is better known for his work with ammonia. It was first used against the Allied soldiers in the battle of Ypres during the first world war. While it was quickly replaced by the more deadly phosgene and mustard gases, chlorine gas has been used as a weapon as recently as 2007 in Iraq during the second gulf war. Chlorine was also once used to make a series of aerosol solvents and refrigerants called chlorofluorocarbons or CFCs. However their use was stopped once it became apparent that when in the atmosphere these compounds absorb ultraviolet light and cause homolytic bond fission producing a chlorine free radical which in turn reacts with ozone. This has led to a reduction in the concentration of ozone in the so-called ozone layer, and therefore a reduction in the protection for those of us on the surface of the planet making us more susceptible to skin cancers. 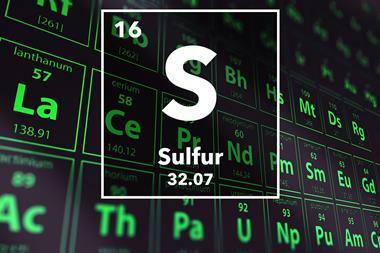 So, that's chlorine – a Jeckll and Hyde element with an extremely wide range of applications. So slap on your sun screen. Tim Harrison was telling the tale of element number 17, and that's chlorine. Tim's based at the University of Bristol's ChemLabs. Next week, the stuff that gives itself an x-ray. This grey metallic element gives off beta particles as it decays. These can cause radioactive damage in their own right, but prometheum is probably most dangerous because those beta particles generate X-rays when they hit heavy nuclei, making a sample of promethium bathe its surroundings in a constant low dosage x-ray beam. It was initially used to replace radium in luminous dials. Promethium chloride was mixed with phosphors that glow yellowy-green or blue when radiation hits them. However, as the dangers of the element's radioactive properties became apparent, this too was dropped from the domestic glow-in-the-dark market, only employed now in specialist applications. And you can hear what some of those applications are when Brian Clegg looks at the story of promethium in next week's Chemistry in its element. In the meantime more elements are available from the Chemistry in its element podcast. I'm Chris Smith, thank you very much for listening and goodbye.